Kabir News Tech Is The Razer’s Edge Gaming Tablet Worth It? Is The Razer’s Edge Gaming Tablet Worth It? Recently mobile gaming has been trying to cater to more traditional gamers with controller add-ons and more impressive games from the puzzles, gem matching, and Angry Bird clones that litter smartphone marketplaces. Take a look at the Razer Edge gaming tablet. When it comes to tablets, these tablets have tons of goods that allow it to handle the current wave of DirectX 11 titles. It is also able to work with add-ons and accessories for a variety of game genres. If you enjoy MMORPGs, there’s an add-on for that. Are you a racing game enthusiast? There is a controller that allows for you to play those games seamlessly. The Edge comes with its own gaming controllers, but also allows for controller docking. GameSpot put the Razer Edge through benchmarking with BioShock Infinite and the results were quite good. During the testing, a few of the bells and whistles had to be scaled back to allow for a fluid game, but the performance was still there and it still looked like a great game visually. The Edge runs the same as your standard PC. You can still do publishing tasks and actual work and web on it using the Windows 8 OS. It wouldn’t work to use the touch screen function for most games, so Edge allows for you to use a few attachments as mentioned above. There are three to use so far, but they allow for gameplay wherever the tablet can be used: keyboard, gamepad, and docking station. The Razer’s Edge isn’t cheap by any means and the attachments add to the price as they are available separately and those run for quite a bit as well. When it comes to most affordable of the three attachments, it’s the $100 docking station. It allows for you to charge and mount the Razer’s Edge. On its own, you would have to connect the cable and lay the tablet down. The horror! Beyond that, the docking station comes with three USB ports, 2.5mm audio ports, and a HDMI-out. The Edge offers only one USB port and the audio port without a docking station. If you’re using the HDMI port, you can connect the Razer’s Edge to the TV easily, but there will be some settings adjusting to get the sweet spot as far getting best working resolution for particular games. It all really depends on what you want performance-wise. Given that the Razer’s Edge uses Windows 8, you can hook up an Xbox 360 controller via USB and use that to play some games. If you’re able to hook up the Edge to the TV using HDMI and Steam, you’ve got quite a quasi-console right there—although one that costs more than a console, the same or a little more all three current generation consoles together, or possibly two next generation consoles. You throw in the attachments and you’re definitely getting a device that costs as much as two next generation consoles. The GamePad weighs in at $250 and is a dual analog controller built into the dock. 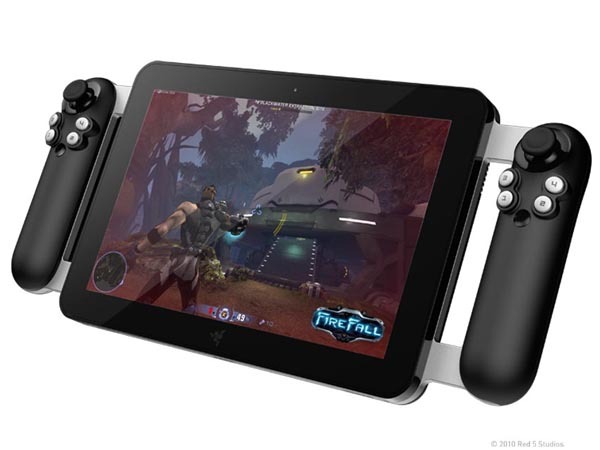 It’s difficult to sell a $250 add-on for a $1,000 (core) gaming tablet or even the $1,300 or $1,450 Pro edition. In the case of most of the titles you’ll enjoy on the Razor’s Edge, you could very well use the Xbox 360 controller. The $70 backup battery would be worth the purchase since the Razer’s Edge batter eats up juice within two hours. However you’ll still need the GamePad controller for the 2800mAh battery. The Pro version of this gaming tablet allows for you to enjoy a great resolution and graphics without dropping the settings by much. The $200 keyboard dock is a great add-on to sit the gaming tablet upright and use as a more traditional console. This can be great if you play a number of PC titles where the Gamepad or your Xbox 360 controller wouldn’t work. The thing is that the Razer’s Edge is too expensive to suggest. When you count the $1,000 of a core tablet and the hundreds you could end up playing when it comes to attachments it might not be worth it to some when you could put that much towards a new console and building up a library for those consoles. As a matter of fact, you could purchase two consoles to enjoy. You could even save up for the next generation consoles and have several hundred left over for games and a celebration dinner for your new console among other things. There are some pros to the Razer’s Edge, it can allow for you to enjoy PC titles on your home entertainment system, the keyboard dock is useful, and being able to use either the Xbox 360 controller or the GamePad for gameplay works well. It’s also pretty powerful for its size. Not only that, but you could take bigger budget titles on the go with you and not have to run with handheld ports of those same titles. However, it’s nothing you couldn’t just do with a gaming console or start work on a gaming rig. Again, the price is incredibly unflattering. If you’ve got the money to throw down on it, snag the Razer’s Edge. As a matter of fact, if you can do a gaming rig the price of this gaming tablet isn’t too unattractive a price. If I had cash, I would love it for the Steam, but other than that it simply isn’t worth putting $1,000 to $1,500 plus inputs. I would just get a better PC for that or a PS3, a HDTV, and a HDMI cord for Steam or even a decent gaming PC and hookups to the TV—all of which would run me way below the Razer’s price.